Age. Learn. Fight. Love. Play Tennis. Win. An award-winning author shares the inspiring and entertaining account of his pursuit to become a nationally competitive tennis player—at the age of sixty. Being a man or a woman in your early sixties is different than it was a generation or two ago, at least for the more fortunate of us. We aren’t old…yet. But we sense it coming: Careers are winding down, kids are gone, parents are dying (friends, too), and our bodies are no longer youthful or even middle-aged. Learning to play tennis in your fifties is no small feat, but becoming a serious, competitive tennis player at the age of sixty is a whole other matter. It requires training the body to defy age, and to methodically build one’s game—the strokework, footwork, strategy, and mental toughness. Gerry Mazorati started playing the game seriously in his mid-fifties. He had the strong desire to lead an examined physical life, to push his body into the “encore” of middle age. In Late to the Ball Mazorati writes vividly about the difficulties, frustrations, and the triumphs of his becoming a seriously good tennis player. He takes on his quest with complete vigor and absolute determination to see it through, providing a rich, vicarious experience involving the science of aging, his existential battle with time, and the beautiful, mysterious game of tennis. Late to the Ball is also captivating evidence that the rest of the Baby Boomer generation, now between middle age and old age, can find their own quest and do the same. "Only a writer as agile and intelligent as Gerald Marzorati could pull off a book like Late to the Ball. Part tennis story, part memoir, part scientific inquiry into the effects of aging, this marvelous book offers pleasures on every page and moves with the energy of Roger Federer in his prime. A wonderful addition to that shelf of sports books that are about so much more than a game." 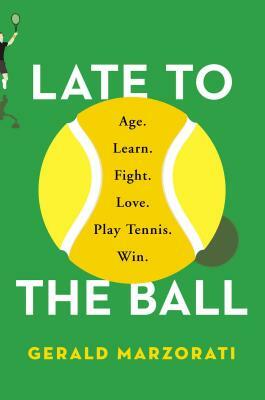 "Late to the Ball is a soulful meditation on aging, companionship and the power of self-improvement. I know that sounds like the kind of cheesy thing people say on the cover of book jackets. But it’s really true." "Marzorati’s prose is conversational, and the book encompasses more than insightful sportswriting—it is an intimate and captivating look at athleticism, competition, and aging."